Other non-RDF source data may be supported in future such as CSV and SQL databases. XML files are read in, and XPath is used to extract values which can be inserted into a triple graph. The graph can be serialised in various RDF formats and is accompanied by meta-data and a property-by-property report to indicate how successful or unsuccessful the mapping process was. Go to the Homepage or to GitHub to find out more. This entry was tagged GitHub, Jena, linked data, Processing RDF, rdf, Semantic Web, Tripliser, xml, XML to RDF, xml2rdf, XMLtoRDF, XSLT. Bookmark the permalink. Are there reasons to prefer this tool to Krextor? Thanks for suggesting this comparison. I would argue that not only is the syntax more concise, it is also considerably more readable. This will only be emphasised as mappings become more complex. 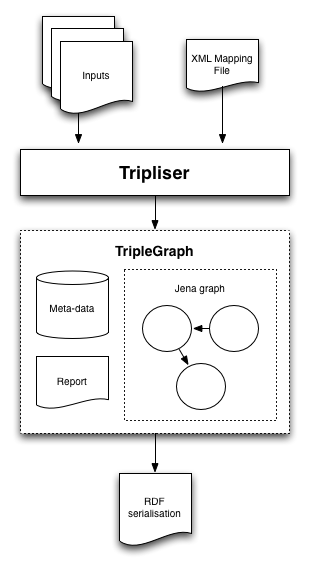 There are other areas where the Tripliser approach is simpler for the user, such as reporting, with varying levels of failure, and graph meta-data. There do seem to be a number of solutions that use XSLT. This was the approach I was trying to avoid as I quickly found the the XSLTs became unmanagable. I must disclose that I have a more general dislike for XSLT as a technology, and would recommend a kind of intermediate modelling in most XML conversion scenarios I have come across. XPath is the genuinely useful part of XSLT.